Marchand Petit are delighted to offer this three bedroom, charming Grade II listed former cider press dating back to the 18th century. The property benefits from gated access with a sweeping driveway leading up to a detached car port with parking for numerous vehicles and a storage area with power and light. 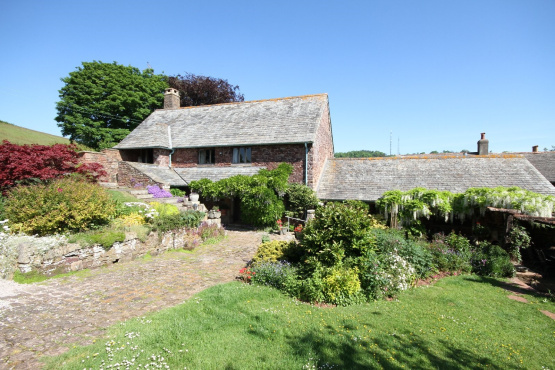 The pretty, stone walled garden enjoys a high degree of privacy and a southerly aspect. Mainly laid to lawn, the garden provides granite steps to the front of the property with granite flag paving across the front. Here the property offers a long store area, an open porch and a pentice overhanging the length of the kitchen/diner covered with wisteria. Internally the property affords a spacious kitchen/diner with vaulted ceiling, exposed beams and a dual aspect. A further entrance hall provides wooden panelling, the original cider press which is still fully operational and stairs to the first floor accommodation. Also located on the ground floor is a study, shower room and the master bedroom which benefits from en-suite facilities. The first floor comprises a generous, dual aspect living area with vaulted ceilings with exposed beams and wooden flooring, a large wood burner with stone surround and a door to a further, raised patio area outside. A second bedroom provides further character features and stairs lead up to the third bedroom with access through to mezzanine area overlooking the lounge. The property is set within a semi-rural, peaceful setting with views across the surrounding countryside. The Pound House is offered to the market with a guide price of £595,000. For further information please contact Marchand Petit’s Totnes office on 01803 847979.